My main goal is to build a portfolio of $1,000,000 in 1500 days with no debt*, starting from 1/1/2013. Every month, I provide an update on my status. 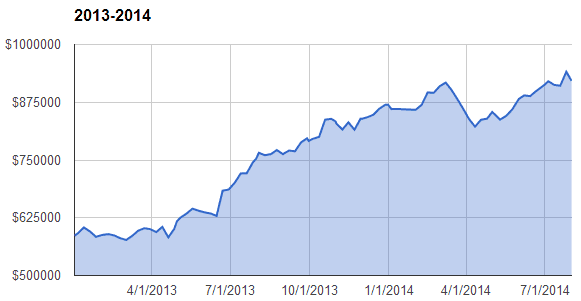 My goal for 2014 is to get my portfolio up to $768,536. Because we saw exceptional returns in 2013, I have accomplished this goal as well as my goal for the end of 2015. Time to look back on the month of July. I’m going to show you mine! I’ve always been hesitant to share my portfolio. I have some individual stocks and I think that this is a dangerous idea for most investors. The last thing I want to do is give anyone bad ideas. For the sake of transparency, I do need to tell you what I own and why I own it. I’ll start doing this one week from today. Stay tuned. **Lawyer/legal bleating: I’m not a financial adviser and this shouldn’t be looked upon as advice. Do your own research! I’ll explain why I bought this next week. fancy LED light bulbs everywhere! It looks like you were a salmon swimming upstream last month. Good job making progress in a down market month. I can’t wait to see what your investment portfolio looks like! Nice! Looking great! 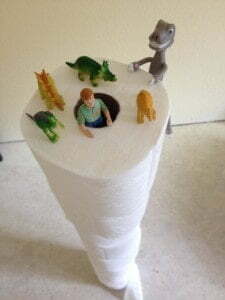 Big fan of the TP tower. You seem to have a plastic dinosaur infiltration problem. That Lego dude looks screwed. The little guy made it out OK, although one of the dinosaurs is going to get him on Thursday. Very interested to hear about your portfolio! I’m scared! That is why it has taken my 19 months. I’ve finally made peace with it. I’m curious to know what everyone thinks of my style. Cant wait to see your portfolio. Very interested to see your high risk selections. Boy everyones portfolio took a beating July 31 and onwards! Asset-Grinder recently posted…Bought 1000 shares of Apple for $95,000. Yes I am crazy! I hardly ever buy stocks. When I do, it’s after a whole ton of thought. Sometimes years. Yeah, come on $1,000,000. Wait, I’m jinxing myself. I take it back! Good job 1500! Sounds like you will probably be retired before 1500 days, how cool is that!? I got like… 20ish years… based on the 40% savings rate (cause that’s about what I think I can save when kids come along). Hopefully things go better than that, if I can find a way to boost income just a little this will come around much faster. I’m quite sure you will have 1000’s of opinions on what you “should be doing” and “how wrong you are”. The point is that it is YOUR portfolio and you can do what you want with it. If nothing else it seems to have been working out for you! I’d ignore anyone’s advice who isn’t willing to share their own portfolio and decisions that went went into building it. I don’t know if you read seeking alpha but for 99% of the comment streams lord almighty i haven’t seen that much preaching since i was in sunday school. There is that magical 1% though that are simply treasure troves of information. I’m quite sure you will have 1000′s of opinions on what you “should be doing” and “how wrong you are”. You have no idea! Some of my nastiest comments have come from when I’ve divulged my investments. The thing is though that I’ve done really well. I’m not saying that I’m an investing genius (luck has something to do with it), but I’ve soundly beat the markets for 10 years. If you can top it, tell me how. This is a great point. Next time someone tries to kick me down, I’ll throw this back at em’! Show me your cards fool! Thanks for your blog-I enjoy it immensely! I am very interested in what you are going to do once you reach your 1million dollar goal. You will also pay off your residential mortgage. What kind of income producing investments are you considering? Maybe this would be a future post or ten? Keep up the great work…you’re an inspiration to us all. FANTASTIC!! Are we going to meet in NOLA?? I would love to meet you and your wife as we can never connect in Dtown. Heck yes! What day are you flying in/out on? Perhaps we can carpool? Am flying out on Wed, September 17, 2014 and Returning on Monday, September 22, 2014. I am on the Lightrail so I just take it to Union Station. Love public transit. Use it or lose it. When are you flying out?? So if you hit $1,120,000 before you hit 1500 days, will you retire early? I would probably call it quits if I had $1 million saved (okay maaaybe only $800,000 – you caught me) and my condo paid off, so about $1.5 million total is what it looks like these days. I need another $1 million to get there! You’re getting pretty darn close to your goal of $1 million! $75k – you should be there in no time.